Among its many investigative features, Freedom exposed agency misconduct and contributed in no small part to passage in 1988 of the Taxpayers Bill of Rights. In 1989, Freedom was the first magazine to report on a new grass-roots movement to bring about a National Retail Sales Tax. ndisputably, the one province of government that causes the most friction between state and citizenry is the power to taxespecially when that power is abused. Many of Freedoms investigations into government issues for the first two and a half decades of its existence were directed toward reform of the U.S. Internal Revenue Service (IRS). The magazine was instrumental in bringing abuses by certain officials and agents of the IRS to public attention, while also seeking measures to safeguard the rights of all taxpayers. As part of its efforts, Freedom staff, working with current and former agents and employees of the tax agency, helped found an organization known as the National Coalition of IRS Whistleblowers. Among its many investigative features, Freedom exposed agency misconduct and computer errors that could have resulted in $1 billion in incorrect taxpayer assessments. The magazines public information efforts, extending over two decades and demanding an end to IRS abuses, contributed in no small part to passage in 1988 of the Taxpayers Bill of Rights. 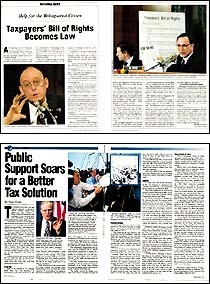 In 1989, Freedom was the first magazine to report on a new grass-roots movement to bring about a National Retail Sales Tax (NRST) aimed at replacing the income tax and increasing the productivity of the nation and its citizens. In 1990, Freedom staff assisted in the publication of an award-winning booklet on the subject, Freeing the USA from the Income Tax, which helped to accelerate the grass-roots movement for such tax reform. The solution promises to be one of the most constructive reforms for government yet. The following article on the National Sales Tax was contributed to Freedom by U.S. Congressman Billy Tauzin in 1998.